The Silver State Classic Challenge is a nutty twice-a-year event where roads are closed and people drive highly modified vehicles at highly modified speeds. The event website says anyone can race, all you need is a car that can average 95mph or greater...but the truth is that you'll want something that can go at least 190mph and full safety equipment to have a good time. 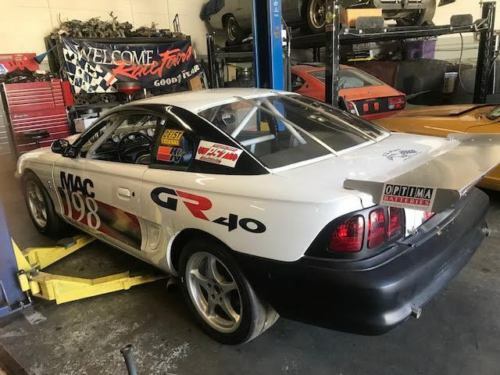 Like this 1998 Ford Mustang Cobra Racer here on eBay offered for $12,000 buy-it-now located in Sacramento, CA. Car originally built by Richard Hille (look him up) for Silver State Run, NV. 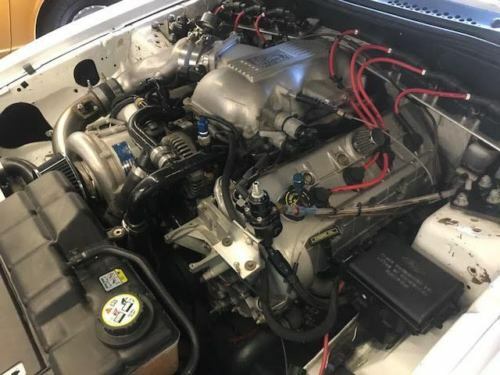 Car ran 192 mph with Sean Hyland Motorsports DOHC Cobra Motor. Over $28k in receipts from Richard, not including price of car or complete Griggs GR40 front & rear suspension. Richard sold to Armen (who I bought car from) in LA, who had shop do maintenance on car & they found low compression in one cyl. He then paid race shop to completely rebuilt drivetrain with over $26k in receipts (included). Rebuilt Areomotive fuel pump with all new supply & return lines & filter housing. Mcleod Clutch Assembly, Mag Force Pin Drive, pilot bearing, pp, pivot ball & new fork. Lexan front & rear windows. Doors gutted. Manual steering rack & manual cobra brakes. Factory Hydroboost system deleted. Fully functional headlights, tailights, turn signals. Engine runs like a beast & is crazy fast. Was tuned to modest 10 lbs boost with 100 octane race gas. With retune & 110 leaded race gas power level would be insane. I purchased car from Amen & then took it out once to the Shelby Mini-Nats 2016 at Sonoma Raceway. Previously installed (Richard) 40 gal cell only had one pickup on side, so when i went into a hard right hand turn caused fuel starvation, shutting off fuel to motor. Only went around track 3 laps, got black flagged for holding up traffic, ending my track day. After that I replaced cell with 16 gal fuel safe fuel cell with intregal fuel anti slosh box pickup. What car needs is some minor sorting. Brake Bias lever doesn't turn so can't adjust bias, needs replaced. Needs dummy pulley/idler installed where factory power steering/hydroboost set was. Current serpentine belt works fine, but really needs additional pulley to keep angle right on serpentine belt & not worrying about belt flying off. Why am I selling car? I am going another direction in racing, racing a Vintage C Production 240z race car. *I will provide winning bidder contact info for both Richard & Armen & file folder with receipts for work done to car. *This is no where near a street legal car, car sold as is, where is, with no warranties expressed, written, or implied. *Kirkey Race seat currently in car will be removed upon sale, and another seat put in its place for transport. You really want a race seat that fits you perfectly.